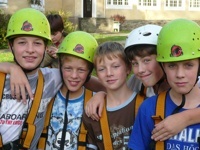 Form 6.2 spent two and a half days at Stift Keppel in Hilchenbach. They were accompanied by our school social education worker Mrs Flender Leweke and Mrs Piroth-Stracke president of our school’s parent organization, who is mother to a student of 6.2. They all left on Wednesday morning and they will be back on Friday by noon. At Stift Keppel the 22 girls and boys learned a lot about themselves and how they act within the group and how to improve. Part of their Erlebnispädagogik activities were climbing ropes between trees. A short film was made of them riding the „ropeway“. Achtung, beide Filme sind recht große Dateien und benötigen, je nach Verbindung, einige Ladezeit!